The artist Eva Mileusnic is delivering these two half-day plaster casting workshops at Interplay where you will learn the basics of plaster casting and make plaster pieces that will contribute to a large-scale art installation celebrating diversity. 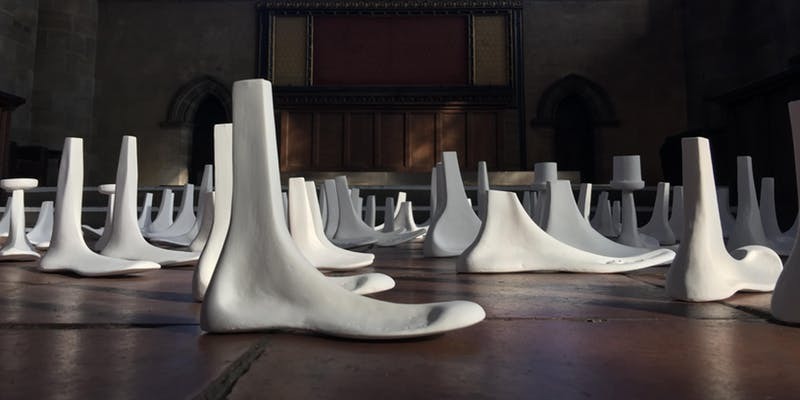 Over 1,000 pairs of plaster ‘feet’ will be exhibited in as installation symbolic of the multicultural city of Leeds, this will be exhibited at Left Bank Leeds in January 2019. As a participant you will be invited to the opening night of the installation to reserve your ‘feet’, which will be delivered back your workshop venue for collection after the exhibition. Participants will cast a pair of stylised ‘feet’ using existing rubber moulds made from lasts (metal structures used for making shoes). These have sections of the world map on the soles, allowing people to choose an area of the world that has significance to them. All materials will be provided and no prior experience is needed to partake. Tickets are via a donation with a suggested donation of £2.50 (should this be too much please feel free to pay what you can, and if you would like to pay more we always welcome additional support). These workshops are part of a larger project celebrating the diversity of communities across Leeds. It has been commissioned by the Donut Group, a network of arts venues operating in neighbourhoods outside Leeds city centre. This project has been made possible with thanks to funding from Leeds Inspired. The art installation, ‘A Critical Mass’ comprising of 1000+ pairs of plaster ‘feet’ with soles depicting sections of world maps, references the global mass movement of people including displaced peoples affected by the current international refugee and migrant crisis who have settled in the UK due to political or economic reasons. Eva is of Hungarian heritage and this has heavily influenced her practice, with culture and heritage being reoccurring themes within her work.